We have a gazillion empty jars with missing lids and sticky paper labels still half-attached. Because of their odd sizes (and busted-looking appearance), they’re mostly used for vinaigrettes, leftovers and random bits and pieces. I was never inspired to stuff them with pretty green leaves. In fact, I was never a fan of salad in jars at all. The trend reminds me of open shelving in a kitchen; it’s pretty to look at but does it function in real life? But these particular jars were just the right size. And… if you looked at them at just the right angle they glistened in the overhead lighting at Target. I bought 8 for $.50 each and decided to give it a go. 1.) Pick the right jar. Choose a squat, wide-mouth jar so you can eat without struggling. An 8-ounce mason jar is too small for an adult human’s lunch (I could eat 4 of them in one sitting) and on the flip side, if your mason jar is too large your fork won’t reach the bottom where all the good stuff is. 2.) You don’t need a recipe. Survey your pantry, freezer, fridge and use up whatever you have on hand first. You’d be surprised at what you come up with without a recipe. Common ingredients in our kitchen include: beans, marinated artichoke hearts, olives, feta and cherry tomatoes. Get creative. 3.) Size Matters. When assembling leafy green salads, layer the heavier ingredients at the bottom of the jar. Ignore this if you are making a mixed grain salad or leaf-less veggie salad. 4.) To dress? Or not to dress? I like to pour a little bit of vinaigrette at the bottom of the jar (where all the heavier stuff is), add fresh basil and marinate overnight for the flavors to infuse. Then, simply shake before eating. You could also dress right before serving, if you prefer. 5.) Don’t go crazy. Keep it simple. Only prep what your family will eat. Once you find your rhythm this technique will become effortless, not work. Interestingly enough, my husband eats more salad now that they’re ready to go in the fridge. And after implementing the tips above, the trend is quite functional after all. They are great for quick lunches, easy to transport, and motivation to use up any leftovers- no waste. As a bonus, they’re also budget friendly. Think about what you spend on lunch here and there during the week. It all adds up! Did I mention they’re fun to eat too?! So what do you think? 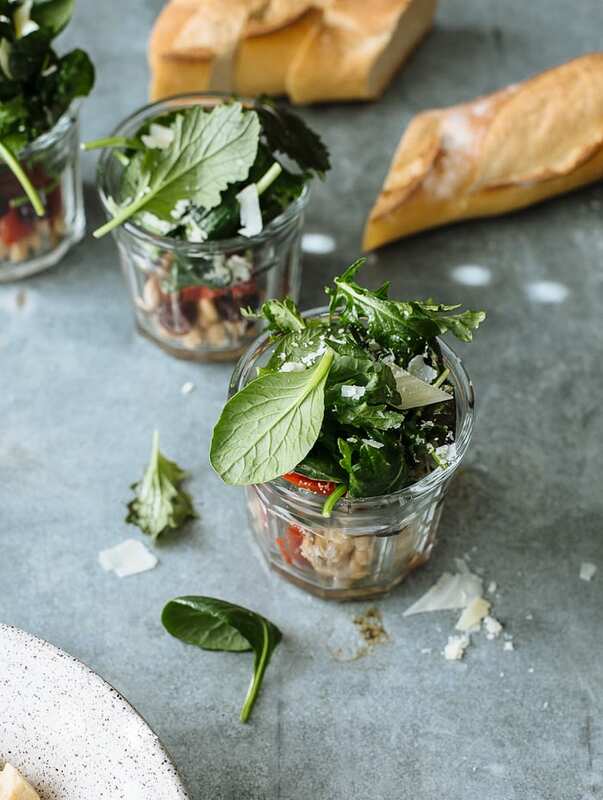 Would you try salad in jars? Salad in jars are excellent for quick, budget friendly lunches. For the recipe below, exact quantities are not necessary as the specific amount will depend on the size of your jar, and of course, your taste preference. Make it your own! **Note: For longer lasting salads, only add the vinaigrette right before serving. In a bowl, combine the first 5 ingredients. Drizzle very lightly with olive oil and add the vinegar. Toss well. Spoon this mixture into your salad jars. Top each jar with greens and sprinkle with cheese. Secure the lids and refrigerate until ready to use. Salads will last up to 2-3 days (**see note above). these salad jars are just gorgeous Emilie – in true Carrot form. You chose your ingredients well both in terms of environment and taste factor – so delicious. My boys taught me the bottoms up shake method with vinaigrette, the best! Target can surprise… I found the prettiest mini planter for my kitchen ledge – just the right size and colour, it makes me smile. They certainly look tempting and would be ideal for al fresco lunches. I haven’t tried the salad in jars method- it felt like a pinterest thing, not a real life thing. And I don’t have the right kind of jars to make this salad hanging around. But if I find some then I’ll be trying this. 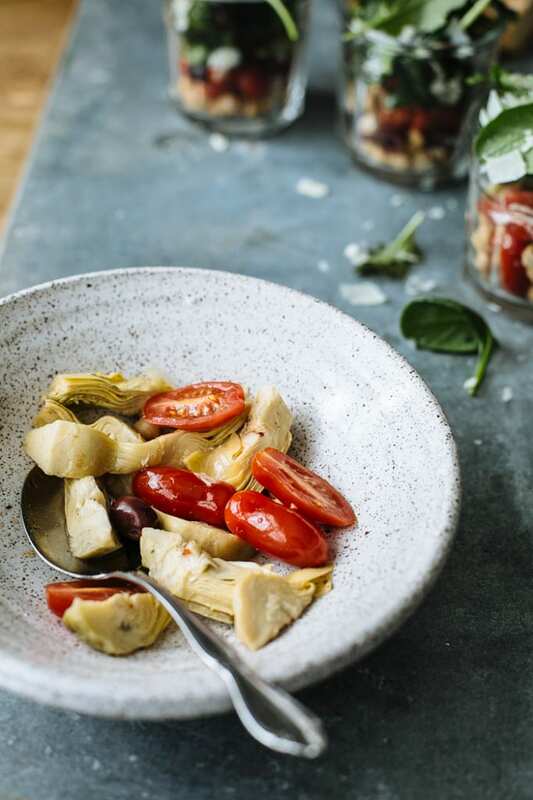 I love the look of this particular salad- chickpeas and artichokes and tomatoes, oh my! This is definitely a neat idea! Love this! Hi Jess! Thanks for the links! I have admired things in a jar for a long time, in fact, I have a popular pinterest board dedicated to “in a jar” but if truth be told, I’ve never actually done it! I think you have made an excellent point that having salads, etc. ready to go in the fridge will promote much more salad eating. I think I’ll be making picnics in a jar this summer to take down to the lake. Thanks for the inspiration. I hopped on the “meal-in-a-jar trend” awhile back when I saw a recipe for portable breakfast oatmeal, and I have to say, I became a convert. I somehow managed to find a beautiful glass jar with a screw-on lid at Target that was made in Italy! I mean come on…it has an etched butterfly and flowers on one side, so I could practically hear a choir of angels calling me to buy it. Anyway, I add old fashioned oats, some skim milk, frozen peaches, my TJ’s grain blend, some cinnamon and honey and a handful of nuts, pop it in the fridge, and it’s ready to walk out the door with me in the morning. Really delicious, satisfying and easy! Next up, your salad jars. These are perfect for a work lunch at my desk. Thanks so much for the suggestion and the lovely presentation. Enjoy your week Emilie. The missing lid problem is REAL! But I find use for the empty glass jars somehow. Really loving this simple salad idea for lunch. I am always on the hunt for a new salad recipe! Such a great idea to make ahead and grab lunch as you run out the door for work. Makes it easy to grab something healthy and not whatever is closest in the fridge! Great tip! Love it! Even though I also thought of the jar thing as a trend, the salads I make every night in a tupperware to bring to work might be far more interesting in a jar. I may actually try this! I’m very much into salads at the moment even though we are nearing the winter season. I love the idea of a jar…far more secure with a screw lid. I will have to check my cupboard for the right size! What a great idea! And they look so delicious. Totally with you Em… I’ve not yet put a salad in a jar… I always figured it was difficult to eat from. No more… I’ll be stuffin my now empty wide mouth ball jars full of tasty greens, beans and the freshest of market veggies! Thank you for this ! There’s nothing that the glistening overhead lighting at Target can’t turn into a irresistible purchase. :) glad you went with the impulse, these are too cute! Gorgeous to look at and so healthy. I love the concept! I love this, Emilie! So many Pinterest trends pass by me until a friend I trust shows me their take on it – like you did here – with so many great tips too! My guy is the same as yours, he will eat anything pre-made in a jar! I portioned out my recipe today on the blog (pad thai) into jars for lunch the other week and he was SO pumped every day to just unscrew a lid a grab a fork. Its the little things that help with “real” life. Totally need to give some jar salads a go. Cheers to fresh to-go food and sales at Target! I love these salads for crazy work weeks! Now the only think missing is the perfect alfresco spot to enjoy them :). Gah! These photos are gorgeous. I will be the first to admit that I’m a bit obsessed with salads in a jar, so this might not really mean anything to “normal” people, but I really love the combination of flavors in this one. Excellent salad in a jar!!! 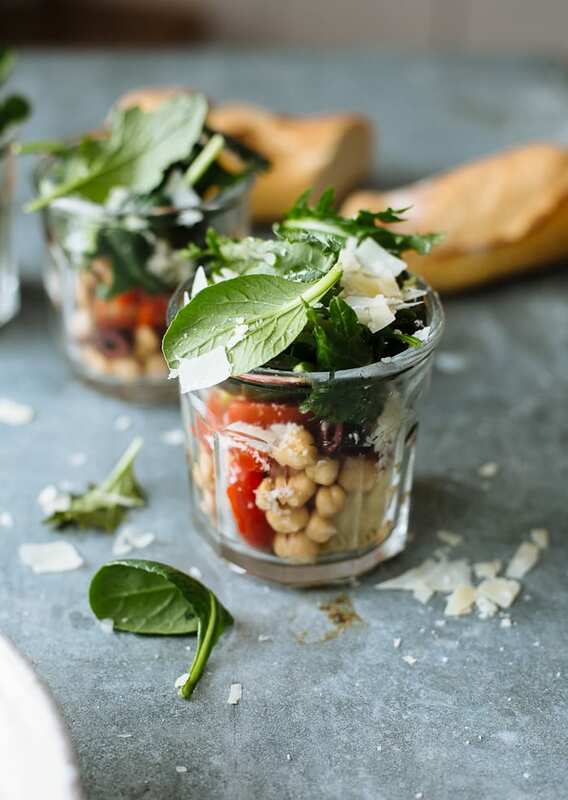 I have not hopped on the salad jar bandwagon yet, but these look totally delightful Emilie. I like the idea of putting a little dressing at the bottom so the veggies etc. can marinate. Thanks for sharing this one!